Think back to the time when repping the logo of your favourite brand was all the rage. Then also think back to when that trend quickly faded and visible brand names became not only obsolete but also uncool. If you saw someone walking down the street in a logo tee, you likely cast instant fashion-girl judgments followed by rapid snickering. Okay, so maybe you weren't that much of a mean girl, but you get the point. Well, we have news for you—this once cliché trend is officially back, and it's nearly replacing band and graphic tees as we know it. Brands and designers alike are churning out tees, sweatshirts and more with their names plastered all over them. 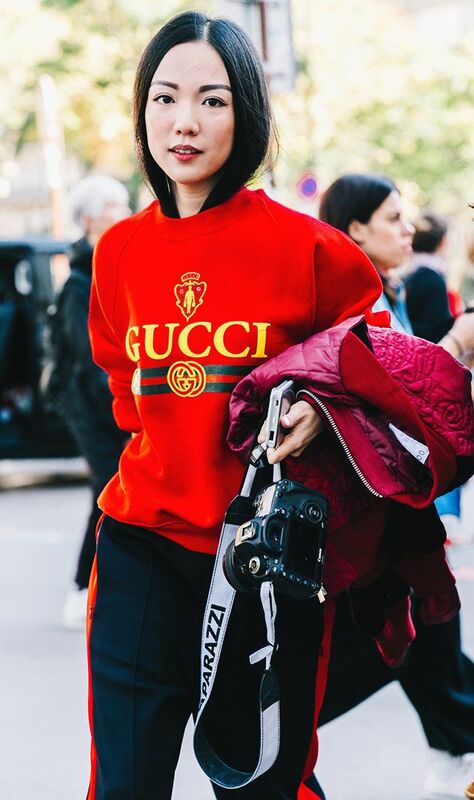 From the blogger-approved (and -obsessed) Gucci T-shirt to the ever-evolving and forever-retro Adidas sweatshirts, this trend has already blown up in the last year and will only get bigger as we navigate our way through 2017. Keep reading to shop the logo tees and to see how the street style set styles them. The perfect piece to wear with track pants. Keep your denim miniskirts looking edgy. Juxtapose frilly items with this sporty logo tee. Proof this trend goes with just about everything. Shop this T-shirt in a grey version ahead. Metallic midi skirts have never looked so good. Swap your white tee for a logo-adorned version this season. This is officially the cool way to wear lace. That logo is just the pop of colour this look needed. For when you want to channel your inner skater girl. This one is like a logo tee in disguise. This shirt is on nearly every blogger's Instagram. Blush pink has never looked so good. This one is street style–approved. Wear your metallic skirt past the holidays with this tee. Want to know more about the key trends this season? See our S/S 17 fashion trends you need to know about.